Review: A rich Mr. Dashwood dies. He leaves his second wife and three daughters Elinor, Marianne and Margaret poor by the rules of inheritance. 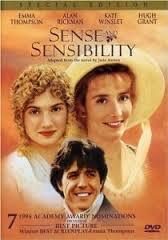 A classic Jane Austen story. This is a very enjoyable and civilized film. While they were working on the script for this Emma Thompson’s computer developed a problem and was unable to locate the file. She took the computer over to Stephen Fry and after 7 hours managed to retrieve the script. The straw bonnet with a pale blue ribbon that Kate Winslet wears at Barton College is the same costume worn by Maggie Smith in David Copperfield (1999) and by Judi Dench in Cranford (2007). At the Academy Awards in 1996 this won one Oscar and that was for Best Writing, Screenplay Based on Material Previously Produced or Published (Emma Thompson). At the Golden Globe Awards the same year it won 2 awards and that was for Best Screenplay – Motion Picture (Emma Thompson) and for Best Motion Picture – Drama. At the Bafta Awards the same year it won 3 awards and they were for Best Film (Lindsay Doran and Ang Lee), Best Performance by an Actress in a Leading Role (Emma Thompson) and Best Performance by an Actress in a Supporting Role (Kate Winslet). This film is listed in Barry Norman’s top 50 Greatest British Films that was published in the Radio Times.